1. Will El Patron’s servants obey Matteo Alacran? 2. How many bodyguards does Matt have left after El Patron’s funeral? 3. Does Matt throw the soup at Major Beltrán? 4. Does Matt succeed in opening the holoport with the scanner for the first time when talking with Esperanza? 5. Does Matt recover from scarlet fever? 6. What is Dr. Riva’s secret? 7. Who else is in the nursery that was used as a bribery tactic to prevent Glass Eye Dabengwa from attacking Opium? 8. What does Maria send to her boyfriend, Matt, through the portal? 9. What does Matt and Cienfuegos see first when they enter the biosphere? 10. What does Sor Artemesia say to Matt to prevent him from becoming more and more like El Patron? 11. Does Mirasol survive after having gone rogue? 12. 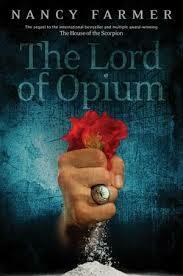 Does Maria succeed in travelling to Opium without her mother finding out? 13. Does Matt, after he goes to the holoport room, succeed in destroying Dabengwa? 14. Who is the “eejit” who helps Happy Man Hikwa escape from Opium’s protectors? 15. What does Matt do at the end of the book that shows his maturity?